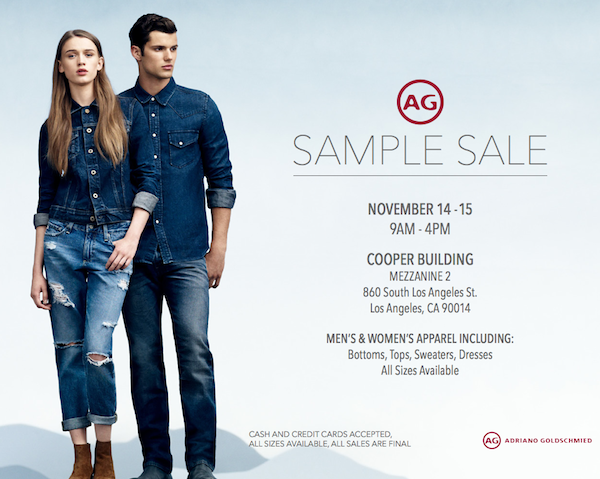 While I was at the Cooper Design Space in DTLA today, I made sure to pop in and check out the AG Jeans Sample Sale and boy was I pleased. You can grab new denim ($60-$80, usually $200+) and apparel for men and women – think $40 silk blend blouses and denim shirts. The sale is running today and tomorrow. And – bonus – they accept credit cards! It also looks like Levi’s was setting up for their own sample sale, so head over tomorrow and you’re sure to spiff up your Canadian Tux for some deals you really can’t beat. This entry was posted on Thursday, November 14th, 2013 at 3:34 pm	and tagged with AG Jeans, Canadian Tuxedo, Cooper Design Space, Denim, Denim on Denim, double denim, DTLA, Fashion, Levi's, Los Angeles, Namaste Showroom and posted in Fashion. You can follow any responses to this entry through the RSS 2.0 feed.